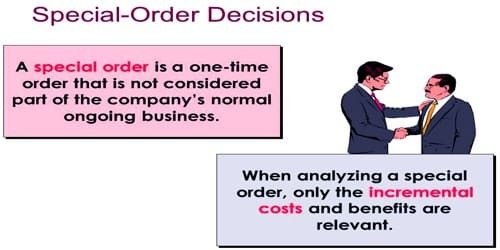 Special-order decisions involve situations in which management must decide whether to accept unusual customer orders. The decision to accept or reject a specially priced order is common in both the service industry and manufacturing firms. Manufacturers are often faced with decisions about selling products in a special order at less than full price. The correct analysis of such decisions focuses on the relevant costs and benefits. These orders typically require special processing or involve a request for a low price. The correct analysis of cost and revenue employs the relevant cost approach. Irrelevant costs should be avoided from the analysis. Fixed costs, which often are allocated to an individual unit of product or service, are usually irrelevant. Fixed costs typically will not change in total, whether the order is accepted or rejected. But the incremental fixed cost is a relevant cost. But there is no harm in including such irrelevant item in analysis so long as they are included under every alternative being considered. When excess capacity exists, the only relevant cost usually will be the variable costs associated with the special order. When there is no excess capacity, the opportunity cost of using the firm’s facilities for the special order is also relevant to the decision. Decide if it increases contribution and profits. A common flaw made when dealing with special-order decisions is to not recognize that the order will take production capacity away from existing orders that generate a higher profit, resulting in a net decline in total profit for the business. The decision to accept or reject special order depends upon how the acceptance of the order will affect the short term financial result. The overall profit will increase if the future total revenue from the special order exceeds the relevant cost. If the future total revenue is lower than the relevant cost, the special order should not be accepted.